A detailed understanding of prehistoric landslides provides fundamental information on the inherent causes of massive rock slope failures in the Alps. In Trentino, a key issue in assessing hazards from rock wall collapse is determining precisely when the large rock avalanches occurred, thus how recently. The Molveno landslide deposits are located in the Brenta group in the central part of the Trentino Dolomites. With an estimated volume that may be as large as 500 x106 m3, the Molveno (1399 m a.s.l.) landslide is one of the largest in the Trento Dolomites. Two source areas have been suggested one to the W at Mt. Soran and one to the E at Mt. Gazza. Conversely, some authors suggest the presence of two landslides one from each of the source areas. 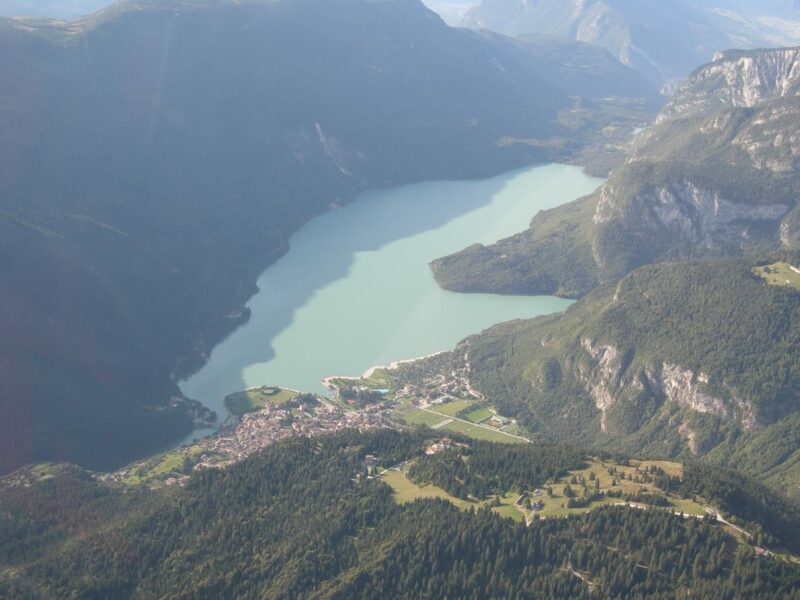 The main rock avalanche body dammed the gorge between the Molveno Valley to the north and the Nembia Valley to the south forming the Molveno Lake (823 m a.s.l.) (Sauro and Zampieri, 2001; Chinaglia and Fornero, 1995). No geomorphological field mapping of the landslide deposits has been done previously. The goal of this MSc project is to use detailed field mapping, remote imagery-supported landform interpretation, cosmogenic nuclide surface exposure dating, and runout modeling to understand the Molveno rock avalanche deposits. Detailed geomorphological field mapping of the deposits, and identification of boulder lithologies will allow differentiation of the several landslide deposits, if indeed there is more than one. Field evidence will be sought to support the hypothesis that the Molveno landslide deposits comprise material from two source areas; Mt. Soran and Mt. Gazza. Information will be gained as well on movement and emplacement processes controlled by local faults. Study of the release area is dependent on access. All obtained field data will be implemented in ArcGIS based on the high resolution DEMs available from the Geological Survey of the Autonomous Province of Trentino. Boulders of the Molveno deposit(s) will be dated with cosmogenic 36Cl. Sample preparation and accelerator mass spectrometry measurements will be done at Ion Beam Physics ETH. Field mapping and dating will be used to decide if there is more than one deposit and from whence it came (Mt. Soran or Mt. Gazza). Study of the Molveno-S.ta Massenza lakes tunnelling reports will allow estimation of the pre-failure topography and the volume of the deposit. The volume of the release area will be estimated based on reconstruction of the pre-failure rock slope of Mt. Soran and Mt. Gazza. With the dynamic runout model DAN3D, the travel path, movement characteristics, flow properties, and final deposit thickness and extent will be modeled and compared to the field evidence. The runout modeling will investigate how the failures from the two different source areas (?) relate spatially, and will aid in determining the plausibility of the E source area. The obtained parameters will be compared with those of other landslides in the Alps. The obtained data will provide the basis for reconstruction of the post-glacial evolution of the landscape in the Molveno area. Understanding the timing of the several (?) failures in relation to the evidenced surface faulting as shown by uphill facing scarps on the Mt. Soran slope (Sauro and Zampieri, 2001). Indeed study and dating of the landslide deposits is one of the only ways to identify periods of prehistoric fault activity, thus the timing of recurrent activity on the Molveno thrust. The final step is synthesis and integration of the Molveno landslide(s) timing into the emerging temporal framework of post-glacial landslide activity in the Alps. Sauro, U. and Zampieri, D., 2001. Evidence of recent surface faulting and surface rupture in the Fore-Alps of Veneto and Trentino (NE Italy). Geomorphology, 40(3), pp.169-184. Chinaglia, N.A.D.I.A. and Fornero, E., 1995. Ipotesi sulla possibile evoluzione cinematica di un movimento profondo di versante: l’esempio del M. Soran (Trentino meridionale). Mem. Soc. Geol. Ital, 50, pp.101-108.